All hell breaks loose when Egyptian princess Ahmanet’s sarcophagus is being flown from Iraq to London and ravens begin to crash thru the cockpit window, in Universal Pictures' The Mummy (in Philippine cinemas on June 7. 2017). As one might imagine, things go downhill from there…and the plane begins to dive. 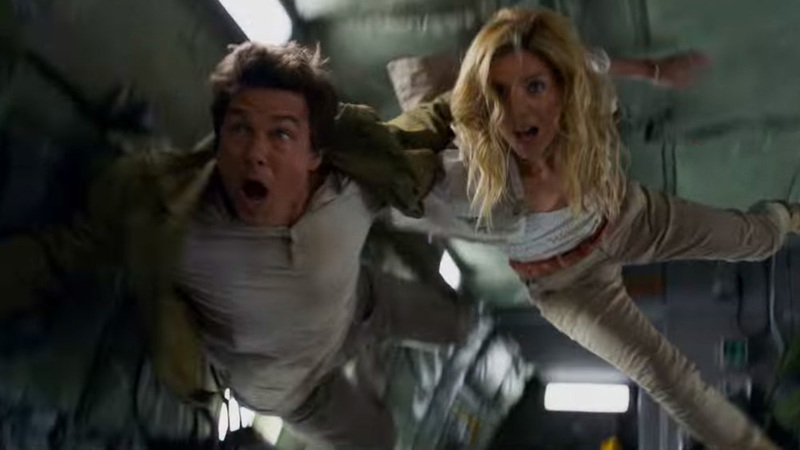 Director Alex Kurtzman and lead actor Tom Cruise were vocal from the jump with special effects department head Dominic Tuohy that they wanted everything to happen for real; this Zero G stunt was no exception. For The Mummy’s pivotal plane-crash sequence, the cockpit action was shot on a stage at Shepperton Studios, while the VFX ravens were added digitally during post production. However, as soon as the sequence called for shooting the interior of the body of the plane during the crash, all movement was done practically, safely on stage. On stage S at Shepperton Studios, this huge 20-ton steel frame cargo plane set was constructed and mounted onto a hydraulic base…proving to be the most complex build for the production. This gimbal allowed for continuous rotation with the actors inside. Simultaneously, it provided a 15-degree tilt—front and back—to simulate take off and start of the crash. This cargo plane set was built from the ground up by Tuohy and his team of 30. SFX began working on the plane build for 16 weeks, then began working with the stunts department. To accomplish this stunning feat of movie magic, there were skilled technicians drawing the rigs—as well as model makers, engineers, power technicians and senior technicians…many who have worked on Dominic’s team for more than 30 years. Never been done before for a film, the production then introduced a real plane at Novespace headquarters, housed in Bordeaux, France, into the mix to complete and film this Zero G sequence. At Novespace a real Airbus A310 aircraft was flown, with 40 cast and crew members inside to experience the Zero G effect. The cast crew did 16 parabolic flights within a two-hour period, twice a day over two days. For the stunt, the pilots enacted a total of 64 parabolas (repeated weightlessness sessions). Each parabola allowed for the filming of a key sequence in the scene. The 20 seconds of weightlessness audiences will see on film leads the crash sequence, with Nick trying desperately to grab parachutes from the plane wall and pass one to Jenny. Each take filmed was unpredictable as the cast and crew floated weightless around the plane cabin…at the mercy of physics. Again the interior of the set was all rubber, this time with obvious weight and safety restrictions for the in-flight journey. This real plane set was 10% less wide and 40% lower in height than the cargo plane set rig that was built on the studio stage.